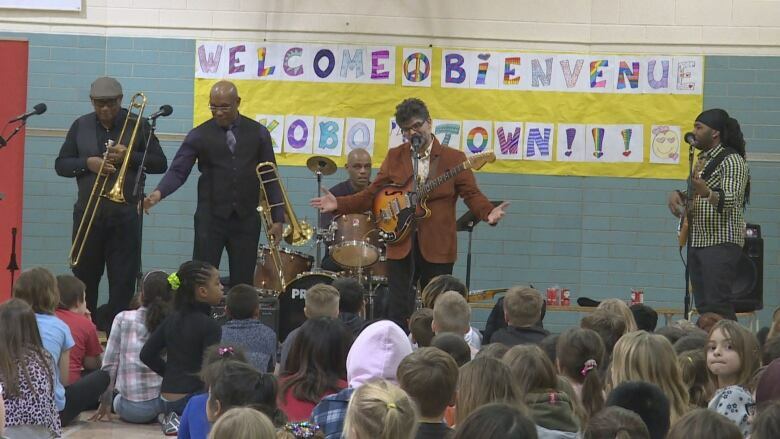 Students at Elsie Mironuck Community School had the chance to perform with Juno Award winners Kobo Town. Is there any better motivation to learn a new instrument than the opportunity to perform with an award-winning band? 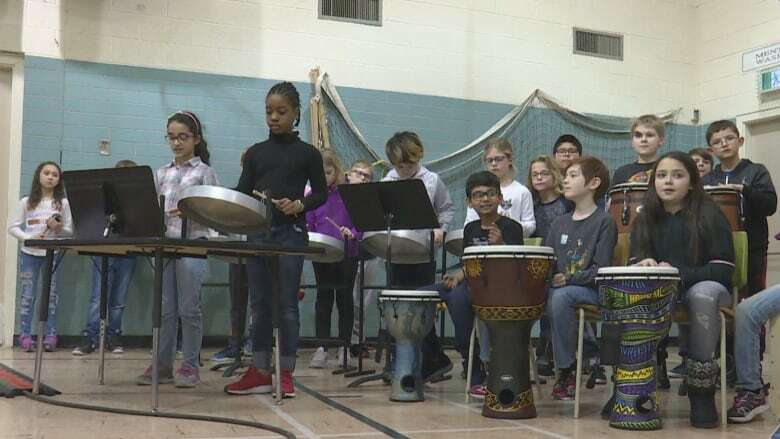 Students from Elsie Mironuck Community School performed Limbo Rock on steel drums and other percussion instruments with JUNO-winning calypso band Kobo Town on Monday. "I really had fun," said Grade 4 student Clinton Horse. Learning the drums was hard at first, he said, but got easier the more they practised. Kobo Town in Regina for the Regina Folk Festival's Winterruption series. 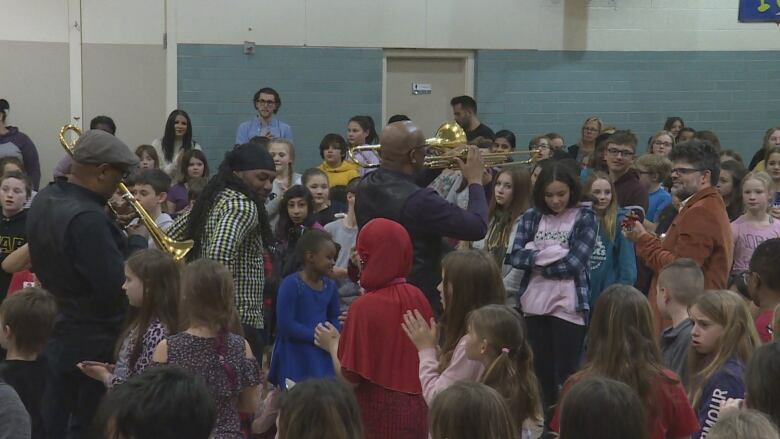 Sponsorship from CBC Saskatchewan made it possible for the band to do a workshop and perform a concert at the elementary school. "It was wonderful, absolutely wonderful, " said lead vocalist Drew Gonsalves. "It's lovely to see a new generation of kids growing up familiar with this music and this art form." Gonsalves was born in Trinidad, the home of calypso music. The workshop at the school was a chance for the band to teach the students about the history of calypso and its messages. "It's closely related to a lot of other folk musics of the Caribbean," he said, explaining that it has roots in the days after emancipation in the late 1800s and grew out of stick-fighting music called Calinda. "It was like a call and response form and full of mockery and taunting and then this grew into like this sort of lyrical and satirical and humorous music that calypso became." For many of the students, performing with Kobo Town was their first foray into calypso music. "It sounds traditional and good," said Grade 4 student Aya Nahle. "It makes me feel like I want to dance and move around." Nahle said she felt lucky, knowing that having a concert at a school is a special experience. As for the performance, she says it went well. "My hands got sore after awhile," Nahle admitted. "So I do not want to play the drums when I grow up." Grade 7 student Nyshane Clarke said it was a nostalgic taste of home. When he was five, he moved to Regina from Savanna-la-Mar, Jamaica. "It's been a long time since I've heard ths sort of music," he said with a big smile. "I always used to listen to it in Jamaica, and since I moved here, I've kind of got new music tastes." Clarke said it was entertaining to see his schoolmates perform. "I'm glad that other students got the chance to learn these things and play them since some of them aren't from the Caribbean islands," he said.